Roughly more than half of the energy that is being used in homes is associated with heating and cooling, which is why proper management of this important aspect of your house will undoubtedly translate into savings. 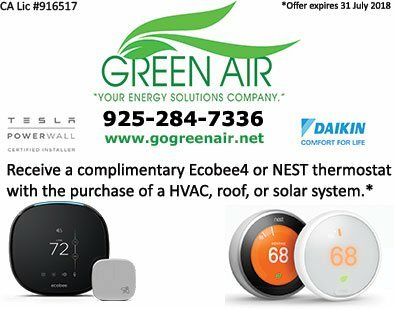 With the help of Green Air, we can install a smart HVAC system in Concord, California to help bring down energy consumption and more. Improved temperature variability – Through a smart HVAC system, you have the power to control the variability of the temperature inside your home. You will be able to heat or cool a particular room in an efficient manner without needing to sacrifice your mobility within, or out of the home. Remote accessibility – Another advantage you can enjoy is being able to access your HVAC remotely. Even if you are still on your way home, just a few touches from your smartphone are enough to turn on the air conditioning system in the rooms that you desire. Lowered electricity bills – With the HVAC in your home working more efficiently, you can expect your energy bills to be cut by at least 20%. More importantly, you will also lessen your carbon footprint and contribute to the welfare of the environment. Turn Your HVAC System Into a Smart One, Today! With the advantages of having a smart HVAC system, there is no reason for you not to replace your old one. Call us at (925) 62-SOLAR or (925) 28-GREEN or fill up our online contact form to receive a free estimate and let one of our energy solutions experts guide you in every step of the way.